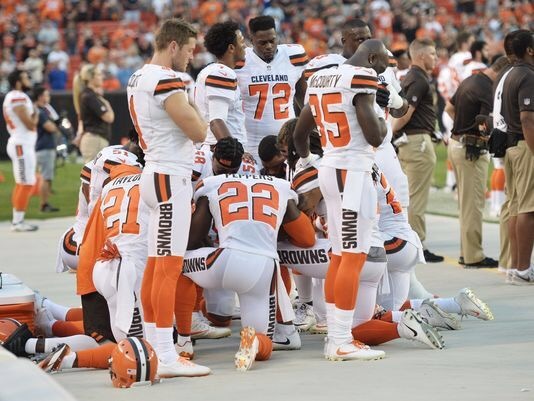 Donald “Twitter Fingers” Trump is now taking aim at two of America’s most beloved sports leagues hoping to cause a rift and divide between players, coaches and even the fans. At a recent political rally, Donald Trump urged NFL owners to fire players and encouraged fans to walk out of games in their own protest in response to players who “disrespect the country’s National Anthem” by kneeling in opposition to racial injustice and inequality. Social media went bananas and everyone from the NFL commissioner to millions of everyday people hopped online to express their contempt for Trump’s disrespectful and divisive rhetoric. 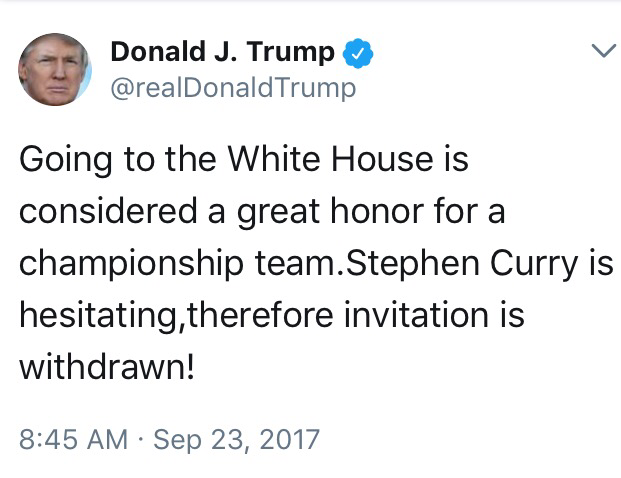 Unfazed and fueled by the backlash, Trump then aimed his Twitter guns at the NBA by rescinding an invitation from the Golden State Warriors and calling out superstar Steph Curry after he made it clear that he probably would not be interested in attending. Apparently the ‘petty presi’ took such offense to players not wanting to ‘come to his party’ that he fired off an early morning tweet univiting the entire team. 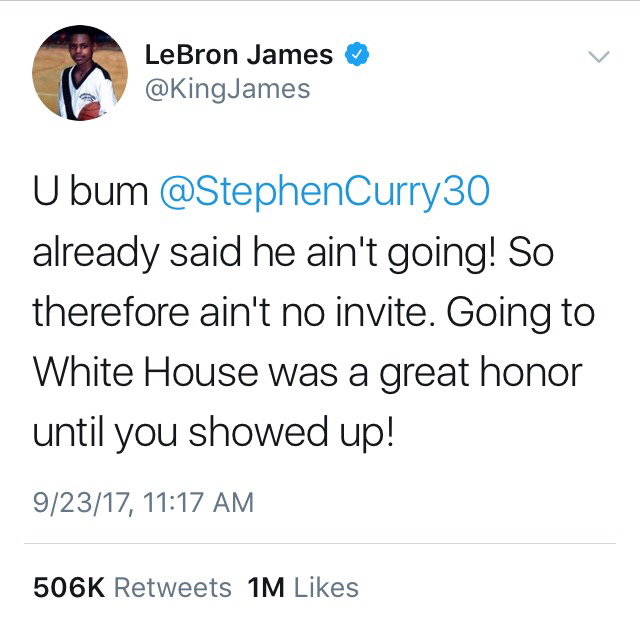 NBA Superstar LeBron James wasn’t going for the sports slander and quickly retorted on behalf of Steph Curry calling Trump a “bum” and making it clear that “ain’t no invite bih” because Curry had already declared that he was not going. James later clarified his sentiments in a videogram in which he pleaded for all people of America to come together in unity instead of falling for Trump’s unmissable plan to divide and conquer. Shoutout to LeBron, Steph Curry and all of the players using thier platforms and influence to shine light on destructive social matters such as racism and bigotry, plaguing America. 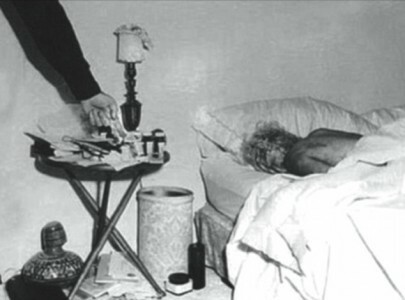 I truly believe that silence is complacency. NBA great Kobe even came out of retirement to address the matter.